The main object of these pages is to show that Evolution is incompatible with the vital doctrines of Christianity. It is first necessary to ascertain just what Evolution properly means. If claims are to be maintained, it must explain the development of all that exists, from primary material to life and intelligence. A theory such as Evolution can be judged not only on the ground of evidence, and the need for adequate forces to cause it to operate, but it can also be tested by its outcome. If it tenets when followed out, are found to be subversive of known truth, in morals and religion, the verdict must be against it. When compared with the foundational doctrines of Christianity, it is coming to be clearly recognized that the teachings of Evolution are antagonistic to them. Compromise is not possible unless the vital truths of Christianity are explained away and replaced by Modernist views. It is thus evident that a choice must be made between evolutionary teaching and the Scriptures as a revelation from God. 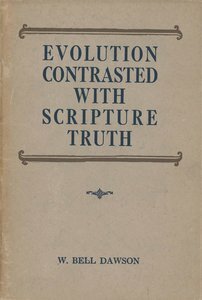 About "Evolution Contrasted With Scripture Truth"